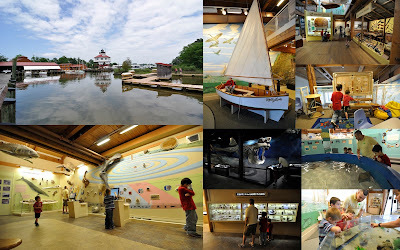 I had looked at the Calvert Marine Museum online lots of times and finally on Saturday we had an opportunity to go! It was just as awesome as I thought it would be, but better. I had no idea this area was as rich in prehistoric fossils as it is!! I just thought they had a plethora of colonial artifacts. Nope! Back when the world was all one giant continent (Pangea) our present day Calvert Cliffs were touching Africa, right where modern day Morocco is. Thanks to this and the constant changing of the water level the cliffs are packed with fossily goodness. They have recovered everything from a huge prehistoric baleen whale skull to a prehistoric camel. RIGHT HERE!!! AHHHH!!!! Josh and I were so fascinated by all this. We could have spent 3 hours in the fossil section of the museum alone. Right around dinner time it started to pour down rain at my house. We watched it while we ate and decided splashing in a few puddles would be the best dessert ever! So, out we went. Just as I was grabbing my camera the sun came out, but it was still raining. Rainbow?!?!?!?!! YES!! Josh called on his way home from work and said "go up the driveway, I can see a double rainbow right over our neighborhood". And here I was excited enough about the tiny bit I caught from the house. Josh pulled onto our street so we turned to head back to the house and just then the sky opened up and rain poured onto my kids as they were running down the driveway in the setting sun. It was so beautiful. I have never been so sure that God is in the rain :) I was also reminded of a Bob Marley quote "some people feel the rain, others just get wet". We definitely felt the rain today! I love this time of year! The dragonflies, cicadas & butterflies are all out in full force. The weather is still pretty bearable and the parks aren't packed with summer crowds yet. We've been spending most of our time outside exploring. 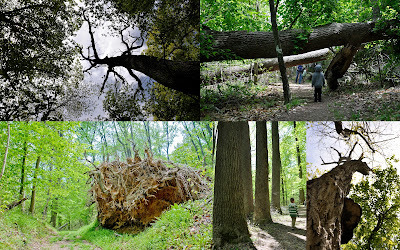 I've got yet another new park in Southern Maryland that is officially on my top five favorites list now: Flag Ponds Nature Park. The beach here is amazing!! That's not all, though. There are the woods packed with gigantic old sweetgum, oak, pine, and maple trees that you can tell have been alive for centuries. The trails wound their way through ponds and swamps as we crept closer towards the Chesapeake Bay. To me, it resembled scenes from Lord of the Rings.